There always seems to be questions regarding how accurate a dropweight tensioner is. In simple words, very accurate. I will present here the physics governing a dropweight tensioner. We know from physics that, in order to rotate an object such as a rotational tensioner indicated in the schematic as a red wheel, you need to apply a torque. Newton has figured out that force = Mass x acceleration. On earth, each object with a mass will exert a downward force equal to the product of its mass (M) and the earth's gravitational acceleration denoted as "g."
Therefore, the gravitational force (Fg) provided by a dropweight is M x g, as indicated with green letters on the schematic. This is why as you move the dropweight farther from the center, you pull a greater tension on the string. When the string is being tensioned, the rotational tensioner does not move. That's because the torque exerted by the dropweight is balanced by the torque exerted on it by the string. Again, the equation for torque does not change: torque = force x distance. On the left side, the distance in question is the distance between the center of the rotational axis and where the string applies its force. In other words, the radius of the tension head is the distance (r) of interest. The force in this case is the "reference tension" imparted on the string. Mass (M), gravitational acceleration (g), and the tensioner's radius (r) are all constant, i.e. they never change. Therefore, the reference tension is directly proportional to the distance (R). That's why a dropweight tensioner is simple and requires no calibration, and is impeccably accurate. Now you must be asking this question: what if the tension bar isn't exactly horizontal? 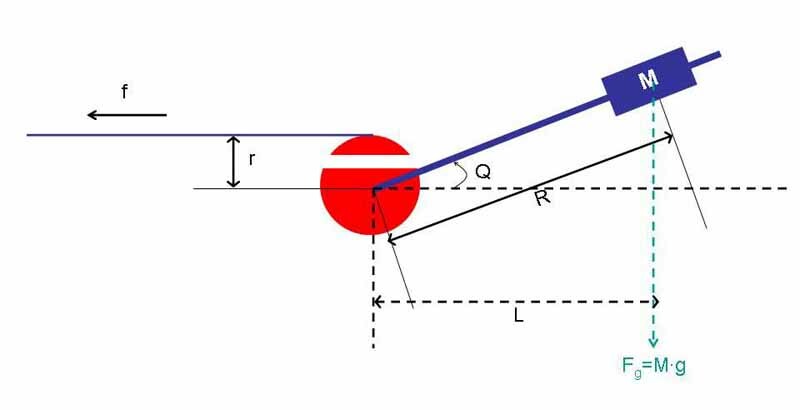 Gravity "does not know" if the bar is horizontal, but gravity does know the true distance between the center axis of the tensioner and the center of Mass of the dropweight. f x r = M x g x L, where L is the horizontal distance between the center of the tensioner to the dropweight. We know from trigonometry how to related R to L, that if the tension bar is resting at an angle Q, then L = (cos Q) R.
At Q = 0, cos Q = 1. Therefore, the number you see on the tension bar, if the bar is resting at exactly horizontal, is exactly the tension you're imparting on the string. Cos 5 = cos (-5) = 0.996, i.e. if you set the mark at 60 lb, but the bar is either 5 degrees above or below horizontal, the actual tension is 59.8 lb. Cos 10 = cos (-10) = 0.985, i.e. if you want 60 lb., you get 59 lb. That's why the advice is that, if the bar is close enough to horizontal, your tension really is close enough to what you want. 1) I use the center of mass of the dropweight to calculate the distance, but the mass of a dropweight isn't at a point. It spans a distance of 3 inches. Does that introduce an error in my calculation? The answer is no. This simplification does not introduce error. If you don't want to take my words for it, I will prove it mathematically. First let's clarify one thing. In everyday life, we use mass terms as force, i.e. 1 pound of force, etc., the reason is that when we say "1 pound of force," it is implicit that we mean 1 pound of mass multiplied by the gravitational acceleration. For instance, 1 kg of force really means 1 kg x 9.8 m/sec^2 = 10 Newtons. Let's simply the equations and use M as force. If you multiply the radius of Center of Mass by Total Mass, it's exactly torque. 2) The tension bar itself weights a few ounces, does that introduce an error? In fact, it does, but the mass of the tension bar << mass of the dropweight, thus the effect is negligible. Also keep in mind that the mass of the tension bar does not change, either. Thus, it is not a variable for your stringing machine. The error can simply be corrected in my equation by adding a small correction to the Mass, by taking into account the mass of not only the dropweight, but also the tension bar. Another thing people ask is, what if I push down the bar to the horizontal position? I took an quick measurement with my dropweight machine. The radius of the tensioner is about 1.2 inches, and the length of the tension bar is about 19 inches. If I apply a force of 1 pound at the end of the bar to keep the bar horizontal, I'm over-tensioning the string by nearly 15 pounds!!! If I apply 1 pound at the end of the 19-inch bar, I will add an extra torque of 19 pound-inch on the right side (torque). That's the same amount of torque the left side has to come up with. Since the "r" for the left side is only 1.2 inch, the extra "f" it will have to have is about 15 pounds (the ratio of the 2 radii: 19 inch divided by 1.2 inch)! If you have a stiff poly and you're pushing down by a force of 2 pounds, you're over-tensioning by over 30 pounds! It can easily break! Well done, although I have to disagree with your last point. There is no “error” introduced into any of this by the bar. The total clockwise (in your drawing) torque applied to the drum is equal to the sum of two torques, the weight of the bar times the horizontal distance of the C/G of the bar from the center of the drum, plus the weight of the weight times the horizontal distance of the C/G of the weight from the center of the drum. The two torques go up and down together by the same percentage, with any change in angle of the bar, since both C/Gs move back and forth horizontally together by the same percentage, so there’s no error being introduced. You're right. The tension bar applies a constant torque which is always there. It simply adds to the torque from the dropweight (which is by far greater). I just meant that, I neglected that part when I wrote down the equation using the dropweight as the sole source of pulling force. Indeed, it does not introduce an error in the actual stringing of the racquet. Using my own dropweight machine as a "standard," I estimate that for each extra pound applied at the end of the tension bar, it corresponds to additional 15 pounds of tension imparted on the string. Allowing the dropweight to drop a little bit shouldn't be too much of a problem. The elasticity of the string will pull back the dropweight, allowing everything to go back to the resting position. However, to drop it from a high position, the dropweight will pick up velocity as it drops down unimpeded at first, and it may create too great of a force and it can actually break the string. Remember, Power = Force x Distance / Time. If you allow the dropweight to drop too fast, it will create great power. It may be possible to break the string if you allow the dropweight to free fall from its highest position. No wonder big hitters break strings all the time. Edited to add a better explanation: if you drop the dropweight from its highest point, it will pick up speed as it drops down. In other words, the dropweight is picking up kinetic energy. When the dropweight finally reaches its lowest point, the kinetic energy it has picked up will have to go somewhere: the string and the frame. If the strings cannot handle that energy, it will snap, and let's just hope your frame is still intact. That's why you need to allow the tension bar to drop slowly. Excellent post, easy enough for me to understand even though I'm quite mathematically challenged . Sticky anyone? definitely knew about the velocity part, but just to clarify--you suggest keeping the weight in hand at all times, right? This minimizing the effect of velocity affecting the accuracy of the job? Just drop the tension bar slowly with your hand underneath, but eventually your hand has to leave the dropweight. Otherwise you're pushing up in the opposite direction of the gravity, therefore reducing the tension you impart on the string. For each pound you push down, you over-tension by about 15 pounds. Likewise, for each pound you push up, you under-tension by about 15 pounds. first, it's amazing how a touch of a 1st yr engineering course can impress so many!!! =) ... nevertheless, your overall analysis looks good (although i didn't read the details). BUT the above highlighted comment is not right. the effect of the tension rod weight is not negligible. when i got my drop-weight, being the nerdy engineer i am, i had to verify that the tension scale on the rod was correct. i took all the above measurements and to come up with my own solution to where the weight should be for a desired tension. i KEPT coming up answers different than the tension scale on the machine. i kept thinking about what horrible engineers must have designed my machine. THEN i realize i forgot about the moment produced by the weight of the tension rod. abra-cada-bra all the numbers mached! and thus, the tension scale on my machine WAS correct! it turns out the tension rod (on my machine) contributed about 5-6 lbs of tension! ... definitely, not to be neglected. this is a bias, so no matter where the weight is along the rod, the tension rod itself always adds about 5-6 lbs. in addition, you need to be very careful when tweaking the mass of your dropweight to account for other error sources. your should NOT do this to account for the tension rod weight. this is b/c the tension rod mass adds a constant bias to the pulled tension, but the mass of the rod affects the tension via a scale-factor (i.e. the distance R). the bias is a result of the fact that the tension rod mass is fixed, where as the scale factor arises b/c the drop-weight mass moves. different error sources, don't mix 'em. You shouldn't touch the tension bar when you do the clamping. Let gravity do its work. Good that you've pointed it out. I've never really considered it in detail, since the tension bar itself applies a constant torque, which means the scale bar is moved up uniformly, a correction for the manufacturers to make. lol i do let gravity do its job. I also have only strung 2 rackets for self. but your comments implied you don't understand how to let gravity do it's job in a dropweight machine. i hope you do understand that by clamping the string while you are pushing the rod down or pulling it up you surely mess up the tension ... you get that, right? Always gently lower the tension rod with your hand underneath the rod. The rod will rest either above horizontal, below horizontal or in the horizontal position. Once it rests, remove your hand from under the rod and then adjust the rod (if necessary) to rest again hopefully in the near horizontal position. There must never be any forcing of the rod to reach the near horizontal position. I found this to be very condescending (esp with the smiley added). It may not have been your intention but that's just how it reads to me. IMO it added nothing to your post but rather put down the OP and the responders. this is awesome... what a high quality, well thought out explanation! i wonder who invented a drop weight stringer (not the method or math behind it... that has been around forever for other uses)... you would have been a great pitch man for this type of invention! Yeah..... but I think it's just a model. If I set my tension to be at 50 lbs and when I pull the string and the bar is horizontal is it exactly 50 lbs that nice. If I ratchet it up once more and now the bar is pointing about 5 degrees upward, did I just increase the tension on the string or is the tension still 50lbs? I am pretty dumb and didn't understand any of the math stuff, but it seems if the bar is pointing up then the tension on the string is higher then what it is set at, otherwise the bar would keep falling. Isn't this the reason when it drops below horizontal you need to keep ractheting it up more and let it drop again until it is horizontal? Bar pointing horizontal means it is just right. Bar pointing up means to much tension? Incorrect (see above). Bar pointing down means to little tension? Correct (see above). Bar pointing horizontal means it is just right? Correct (see above). 2. Tie the string to the end of your finger. 3. Place your elbow on the edge of a table and rotate your forearm so that it points straight to the sky (weight should be hanging directly beside your forearm). 4. Rotate your forearm so it horizontal and hanging off the table (weight should be hanging 90 degrees from your forearm, now). 5. Observe the effort it takes to resist the weight as your forearm moves closer to horizontal. 6. Now, let your arm drop below horizontal and see if you can feel the weight decrease (less effort) the further your arm drops. 7. Lift your arm back to vertical then try it again. ** the heavier the weight... the more you'll feel the effect. Cos 5 = cos (-5) = 0.996, i.e. if you set the mark at 50 lb, but the bar is either 5 degrees above or below horizontal, the actual tension is 49.80 lb. Cos 10 = cos (-10) = 0.985, i.e. if you want 50 lb., you get 49.25 lb. ** See OP's original post for diagram. I have one question here. you said that if I put an extra force of 1lbs on the end of the tension arm to force it to horizontal, I'd be overtensioning by 15lbs. What if I raise the tension arm and let it swiftly drop down, then it becomes horizontal? would that be along the same effects? 1. When the bar is lower then horizontal, the string can't be at 50 lbs, but must be less depending on how low the bar is. This makes sense. 2. When the bar is level and completely horizontal then it is at the set tension of 50 lbs, no more and no less. This makes sense. 3. When the bar is ratcheted up one more notch from horizontal, it has to be also at 50 lbs, no more and no less. Sounds confussing now. a. It can't be less then 50 lbs because it was at horizontal at one time and thus at 50 lbs. b. It can't be more then 50 lbs because the drop weight isn't heavy enough to drop down the bar anymore because the tension on the string is at 50 lbs. To test it out, I pulled some string through the first mains and mark the string at the frame. a. When I put the string in the tensioner and started to tension it up, the mark move away from the fram as expected. b. When the bar was level and horizontal (at 50 lbs), I marked it again at the frame . c. When I ratcheted the bar up agian one more notch, the mark did not move. When I move it up again another notch, the mark didn't move. When I move the bar passed 50 degrees or so, the bar moved back towards the racquet and the mark went inside of the frame and lost tension. If the bar is lower then horizontal, then keep ratcheting it up until it is level or slightly above level and then you will be at the tension you set it at, in this case 50 lbs. Measuring how far the mark moved isn't an accurate method as that would only measure the elasticity of the string, not the tension. Over wide ranges, there will be a relationship between tension and elongation works, but we're talking from 0 pounds up to whatever tension it takes to physically break the string, say 500 pounds. Within the range your tensioning, the string won't stretch enough for you to measure by eye. The tension however will be higher and you'll be clamping and holding that tension. So if you reach horizontal at 50 pounds, ratchet it up and allow it to drop where the arm is now above horizontal, the tension on the string will be lower. The tension is only 100% correct at exactly horizontal. Above or below that = lower tension. Then you run the risk of breaking the string... since that would momentarily place much more than 15 lbs. of tension on the string. The best thing to do if you see it's not going to stretch any more and naturally fall to horizontal (even very slowly) is lift the weight and remove some of the tension... then let the weight re-tension the string on its own. Have you ever taken physics and/or trig? If you have it becomes very clear. Also, try the string thing I mentioned in my post... you'll FEEL the difference. 3. When the bar is ratcheted up one more notch from horizontal, it has to be also at 50 lbs, no more and no less. Sounds confussing now. No, it's LESS than 50 lbs. The tension will be the highest when the bar is horizontal. Anything more or less will be LESS than 50 lbs. a. It can't be less then 50 lbs because it was at horizontal at one time and thus at 50 lbs. This is where the Trigonometry and Physics enter... it IS less than 50 lbs. when the bar is not horizontal (higher or lower). b. It can't be more then 50 lbs because the drop weight isn't heavy enough to drop down the bar anymore because the tension on the string is at 50 lbs. You are correct... 50 lbs. is the max if the weight is set at 50 lbs. and there is no additional force pushing the weight down. Don't forget that string stretches. c. When I ratcheted the bar up agian one more notch, the mark did not move. When I move it up again another notch, the mark didn't move. When I move the bar passed 50 degrees or so, the bar moved back towards the racquet and the mark went inside of the frame and lost tension. Exactly... tension was pulled and the string stretched until you hit 50 lbs... then when you dropped below horizontal... the tension again dropped below 50 lbs. so the string retreated and the mark moved backward. If the bar is lower then horizontal, then keep ratcheting it up until it is level or slightly above level and then you will be at the tension you set it at, in this case 50 lbs. Almost! ONLY at horizontal will the tension be exactly 50 lbs. Sometimes, it takes a number of 'ratchets' to remove the 'stretch' from the string. Once the stretch is all removed... at that same 50 lbs. the bar should stay horizontal and not move a millimeter. That is when you know... for that type of string with those unique stretch characteristics it is at exactly 50 lbs. of tension. Thanks again everyone for your detailed inputs. I think I understand now, just hard for my brain to fully understand. Best thing for me to do is to get it as close to horizontal as possible and then just set the clamp. Extremely useful to all dropweight stringers that are being told off from others for their machines not being reliable and accurate. I use a Pro's Pro challenger I machine with 6 points mounting and fixed clamps and i get the same DT results over and over again while friend of mine that strings on local stringer (older electronic one) gets different DTresults (+/- 1) !!! Very good post and explanation. As an aside, when using dropweights, you do want to release the dropweight by hand above the horizontal. Let the dropweight stretch the string (a lot or a little if poly/kevlar) to arrive at its desired horizontal position. Then clamp. Clamping too early is not good. You end up with inconsistent results. Best post regarding drop weight machines. I just gave my ATS/Gamma drop weight machine a hug! I'm also giving her a gift- a starting clamp! Happy Holidays!! Been using my DW machine for nearly 4 years now and still love it! Thanks Bud! I should have listened to you sooner though, all that wasted money! I was just using my brand new drop-weight machine and admiring the design. Due to the design, there is very little tension variance between the bar being horizontal and a little off horizontal. As the OP pointed out, the tension is a function of the cosine of the angle off horizontal. But it's useful to note the small angle approximation for cosine is 1-((x/57.3)^2)/2. (where x is measured in degrees). Because the angle off horizontal is divided by 57 and then squared, for small angles the cosine is relatively invariant to the angle (because you're on the flat segment of the sine curve). A 5 degree tilt is extremely noticeable because one end of a 2 foot bar would be about 2 inches higher or lower than the other at 5 degrees (and about 4 inches at 10 degrees). The drop weight is a simple and elegant design for achieving a precise tension. danno... saw an earlier post from you that you play out of the MAC... What age and rating?? I used to live in East Lansing.